This test method was designed to determine tensile properties of plastics based on the general principles given in ISO 257-1:2012. These properties include tensile strength, strain at break, modulus, and yield. Products that may be tested in accordance with this standard include thermosets, thermoplastics, and fiber-reinforced plastics. Test specimens may be rigid, semi-rigid, molded, or extruded plastics and are commonly in the shape of a dumbbell or dog bone. Repeatable strain measurement – An extensometer is required by the standard to accurately measure strain. 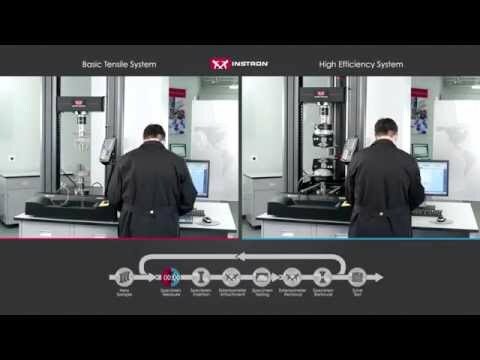 Advanced strain solutions include non-contacting extensometers, such as the Advanced Video Extensometer 2 (AVE2) and automatic contacting extensometers, such as the AutoX 750. These solutions have the accuracy to measure modulus as well as strain to failure and require little influence from the operator which can resulted in improved repeatability. A 75mm gauge length clip-on extensometer, such as 2630-123, also meets the measurement accuracy stated in ISO 527-2:2012. For quality control testing a 50mm gauge length extensometer, such as 2630-111, is still compliant. Secure gripping of varying specimens – Mechanical wedge grips or pneumatic side-acting grips with serrated faces are suitable for most rigid and semi-rigid plastics. Reporting calculations in compliance with the standard – Instron Bluehill® Universal testing software has advance pre-built methods available with pre-configured plastic specific calculations helping to ensure compliance. For labs with a high volume testing, Instron offers both the robotic 6-axis AT6 and the non-robotic 3-axis AT3 automated testing solutions. It is important to review ISO 527-1:2012 and ISO 527-2:2012 in order to fully understand the test setup, procedure, and results requirements.